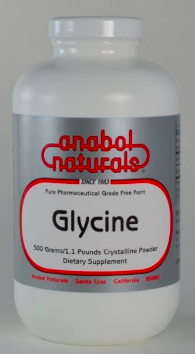 AnabolNaturals’ Glycine is a pharmaceutical grade, pure crystalline free form amino acid that has one of the simplest molecular structures of all the amino acids. Glycine has a calming effect on the brain and is also involved in growth. It may help promote a deeper sleep, faster, without the morning after effects associated with prescription or over the counter sleep medication. Glycine also has a positive impact on attention and memory in adults. Directions: As a dietary supplement, use 1/44 to 1/2 teaspoonful daily between meals or as directed by your healthcare professional.